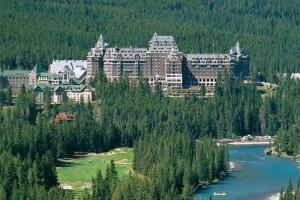 Located in the heart of Banff National Park, the Fairmont Banff Springs hotel stands as a landmark in the picturesque alpine town of Banff, Alberta. This hotel offers all the amenities of a world-class resort, with 764 guest rooms and suites. From cozy rooms tucked away in quiet corners of the castle to spacious suites with sweeping Alberta mountain views, this hotel offers perfect accommodations for your Rocky Mountain getaway. Located in Banff National Park. 1888 Chop House, Bow Valley Grill, Castello Ristorante, Samurai Sushi Bar and Restaurant, Waldhaus Restaurant, Waldhaus Pub & Patio, Rundle Lounge, Grapes Wine Bar, Ramsay Lounge, Stanley's Smokehouse, The Lookout Patio, 13 Below, Castle Pantry. Downhill and cross-country skiing, dog sledding, snow shoeing, skating, a 27-hole championship golf course, hiking, fishing, river rafting, horseback riding.